iPad Media Camp* is a three day series of hands-on workshops designed to inspire and equip educators to facilitate student media projects using iPads. Participants should BYOI (bring your own iPad) to camp. iPad Media Camp is led and facilitated by Dr. Wesley Fryer, author of the 2013 ebooks, “Mapping Media to the Common Core: Vol 1” and “Hopscotch Challenges: Learn to Code on an iPad!” and the 2011 ebook “Playing with Media: simple ideas for powerful sharing.” 2014 will be the third summer of iPad Media Camps! Check out how the curriculum of iPad Media Camp has evolved and changed since 2011 when it started on our curriculum site (wiki.ipadmediacamp.com) powered by Google sites. Select the session you want to view in the left sidebar of the site. Curriculum for summer 2014 will be shared publicly as sessions are offered in June and July. Registration for Summer 2014 iPad Media Camps is open to all PK-20 educators, with the exception of 16-18 June 2014 (Houston, Texas) which is only open to elementary teachers. The Houston iPad Media Camp will be co-led / co-facilitated by Gail Lovely and Wesley Fryer. The other three sessions will be led/facilitated by Wes. Check out this two minute video trailer for iPad Media Camp to learn more! 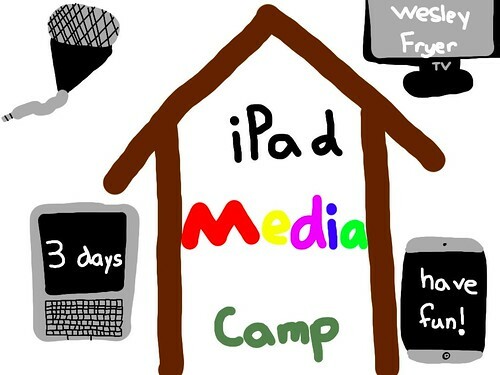 I hope to see you at an iPad Media Camp this summer!